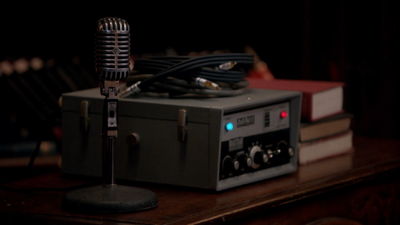 Angel radio is Dean's nickname for the conversation between angels that other angels can hear. The phenomenon is first named by Dean in 4.09 I Know What You Did Last Summer. It is later used by others including angels such as Castiel and Metatron. 1.6 9.23 Do You Believe in Miracles? Dean and Sam find Anna Milton, who has escaped from a psychiatric hospital. She describes how she can hear the angels talking. Dean responds: "So, they lock you up with a case of the crazies when really you were just... tuning in to angel radio?" When Sam and Dean are in Heaven, Ash describes how he has rigged up a laptop to overhear and translate the angel's speaking in Enochian - what he calls a "holy-rolling police scanner." Samandriel uses telekinesis to remove the spike preventing him from using angel radio. He gets a message to Naomi, but Viggo walks into the room and discovers that he's been on angel radio. Although Samandriel denies it, Viggo doesn't believe him and reinserts the spike into his forehead. Later, Viggo uses a headgear torture device to affix the spikes to his head and prevent him from removing them again. Metatron listens in on angel radio to find a "cupid" so that he can retrieve their bow to seal the gates of Heaven. He calls it the "Cupid Frequency." Castiel, like Anna, can hear the angels even though he has lost his grace and is human. Metatron sets up a radio in his office to broadcast to all angels on Earth and in Heaven across all frequencies of angel radio to let them know he is traveling to Earth and closing the portal while he is gone. When confronting Castiel in his office, he doesn't realize Castiel has activated the microphone and Metatron's true intentions and opinions of the angels are broadcast to everyone, leading to his downfall. Castiel is besieged by voices on angel radio. He tells Sam and Dean that there has been a massive surge in celestial energy, which can only mean that Lucifer has sired a Nephilim. When Lily Sunder confronts the angel Benjamin in a fight, before she delivers a killing blow, Lily allows Benjamin to send out a message over angel radio, which is received by the angels Mirabel, Ishim, and Castiel. Through her century-long honing of Enochian magic, Lily Sunder is also able to tap into angel radio and listen in to what the angels are saying. At a pit stop, Castiel tells Kelly Kline that he has been communicating with Joshua regarding what to do next with her. 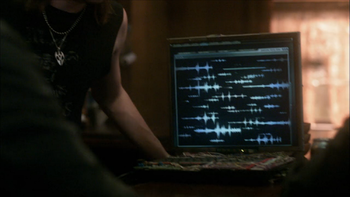 The Nephilim, Jack, is shown to be able to hear angel radio, which causes him great pain. Jack learns through angel radio that angels have captured Kaia Nieves. During the angel siege, Dean asks if Jack can do anything to help; Jack tells him he could try but the angels would just hit him with angel radio. Castiel learns from angel radio that a vessel has been found mutilated -- a cherub whom Lucifer had murdered after stealing his grace. Later Sister Jo reveals to Lucifer that she heard of the cherub's death on angel radio. After Lucifer's surprise arrival back in their universe, Castiel checks angel radio in hopes of tracking him. However, Castiel finds that he can hear nothing but static, a fact he finds disturbing. After the Cosmic Entity lays siege to Heaven in search of Jack, Castiel reports to Sam and Dean that angel radio has sent out a distress signal and all the gates to Heaven have been opened, including the gates sealed by Metatron. Castiel arrives at the playground to find out if Mary Winchester is in Heaven. Using angel radio to try and get Naomi's attention, he is instead met by Dumah, who confirms Mary's death. This page was last edited on 19 April 2019, at 11:45.